We just had the best, cheesiest, cheapest, ridiculously fun 24 hours in Myrtle Beach. Yes, you read that correctly. No, Myrtle Beach has not gone upscale, there were no cucumber scented towels, butlers or perfect turn down service. You know how a corn dog and Coke Icee sometimes tastes soooo good? It’s not healthy, you can’t eat that way every day, but sometimes, it’s just what you need. That is exactly what a trip to Myrtle Beach is. We’ve had a rough time lately. We had a large house fire and have had a few deaths of close friends. We’ve been in a pretty low place to be honest. Luckily we have a summer house to visit in South Carolina. But the kids were bored, it’s quiet here (quiet and beautiful) but a little too quiet. 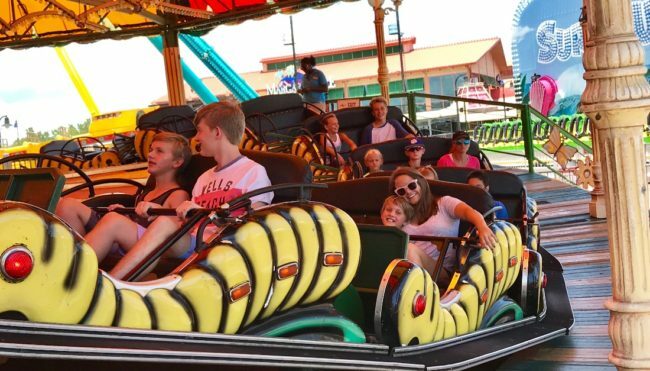 They needed some fun, and sometimes the best kind of fun comes in a place where you’ll find funnel cake, a bed of nails to lay on and rides that make you so dizzy you puke. 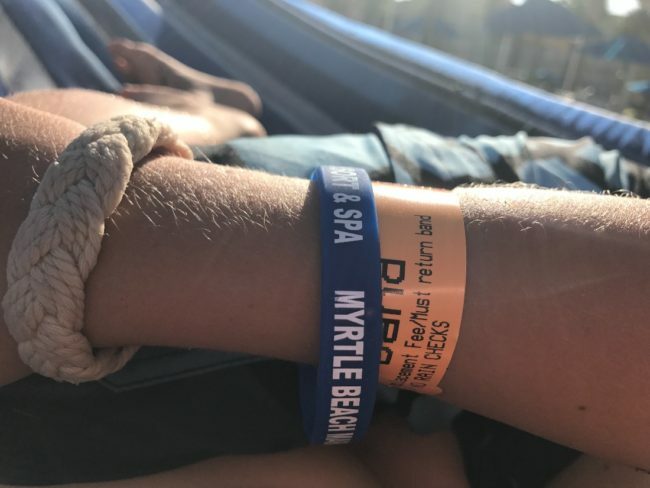 Myrtle Beach is not a luxury destination. When I asked my travel agent for a nice hotel, he texted back laughing at me. The kids describe Myrtle Beach as a combination of a local fair, Time Square and a strip mall with silly stores. That’s about right. 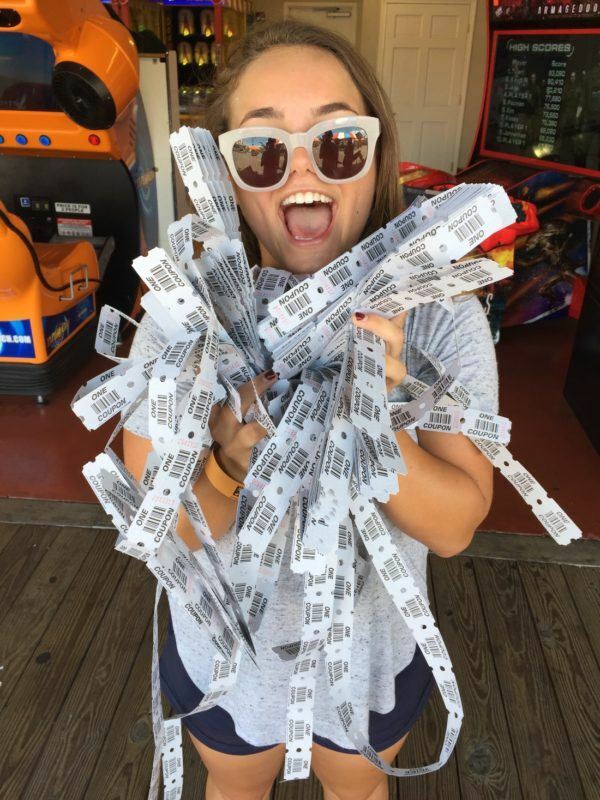 There are a million attractions around Myrtle Beach. Think Vegas, but without the celebrities. Upside down house? Check. Go karts? Check. Medieval Times? Check. We spent two days at Broadway at the Beach. It has three separate amusement ride areas, an aquarium where you can touch sharks, some tacky shops and a lot of really bad for you food. It’s only $28 or an all day Super Pass band that lets you ride all the rides as many times as you want. We never stood in line. 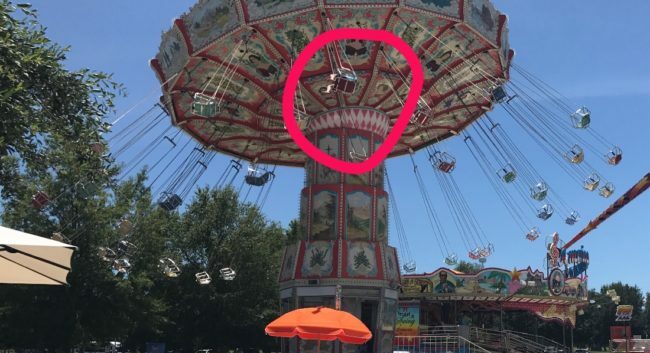 In fact, the second day we visited, Keaton was the ONLY kid on the ride. It could be that it was 95 degrees out, but he did NOT care. He’s shoeless and flying through the air happy as a kid can be. Ripley’s Aquarium is right on the boardwalk and serves as both “place to cool off” and entertainment. I am fairly certain there is no oceanic research going on here. There are mermaid shows, touch tanks and some pretty cool sharks. 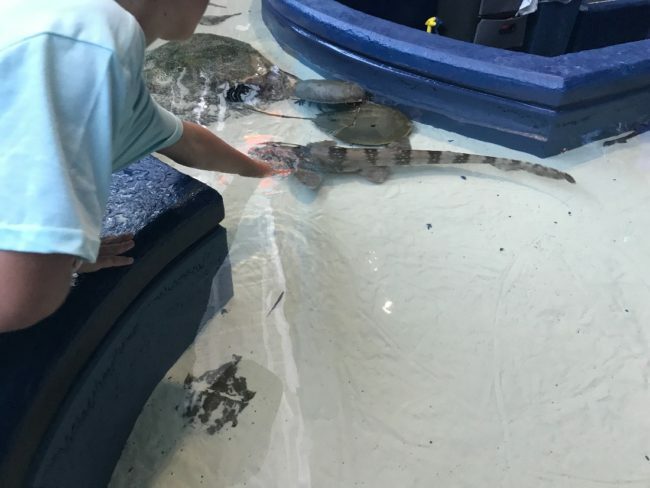 Keaton petted a shark while a horseshoe crab burrowed in the sand to hide from all the sticky little fingers, it was a scene right out of Finding Dory. Tickets are $28 for adults, $18 for kids. 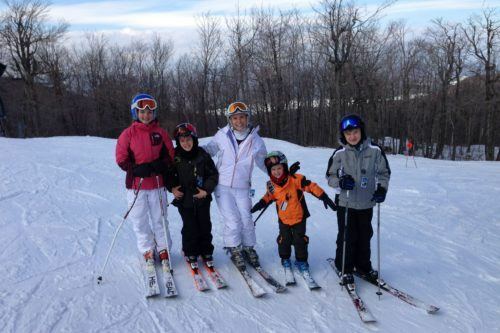 There are a ton of combo deals, trust me, just the entrance fee is enough – both money – and fun. JJ and I are obsessed with octopi. We believe they are smarter than most humans and tried to establish a relationship with this one and ascertain if he was being held against his will and if so, does he need help planning an escape. Keaton said people were looking at me weird and if I didn’t stop he was leaving. In addition to all the nausea inducing rides you can imagine, there is a fun arcade in the East Pavilion. All the games give you tickets, of course Macie is the queen of winning games of chance. We call this photo – That Time Money Bought Happiness. I am also a mad sucker for a photo booth. 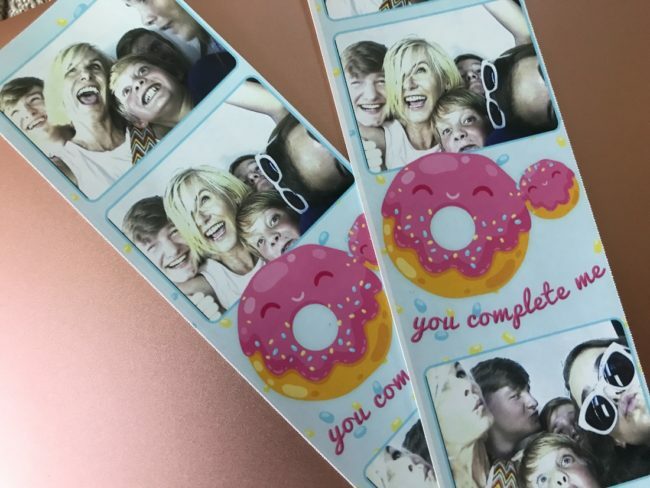 Poor Wilson – it’s a dog eat dog world in this family, and sometimes you’re the dog that got sat on in the photo booth. Across the street from Broadway at the Beach is a Go Kart park – Broadway Grand Prix. Ever wonder who grabs all those glossy touristy brochures and reads them? Keaton does. He found this and insisted we had to hit the Go Kart park. Of course because it’s Myrtle Beach, this is so much more than just Go Karts, there are arcade games, rides, and God knows what else. I limited our stay to just a few hours. I recommend just buying tickets for rides, it was cheaper than the all day pass, and staying all day would have killed me. Also, for some reason, they didn’t often take the kids’ tickets, we ended up giving some away as we were leaving. This park is best enjoyed at night when it is cooler. The tracks you can race on are based on your height. You would think this is mostly kids, you would be wrong. 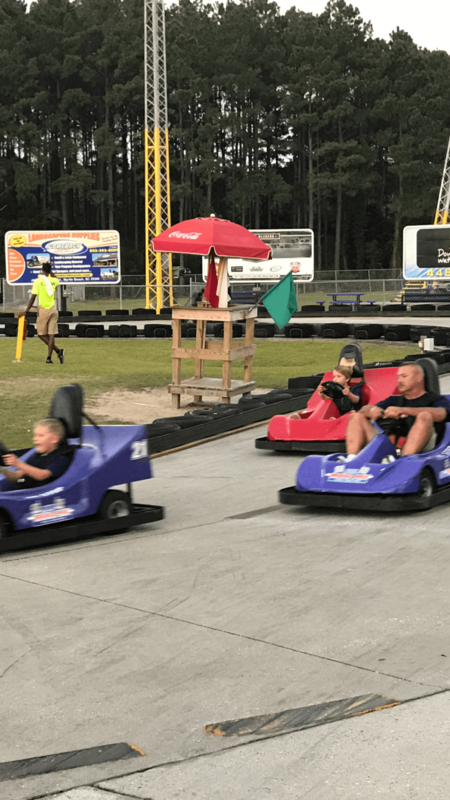 There are a surprising number of adults who want to Go Kart race and they will run into your children and cut them off as if they are actual NASCAR drivers, which they clearly are not. No one got hurt, and they learned a valuable lesson, there are a lot of weird adults in the world. The only hotel I can recommend is the Marriott Resort and Spa at Grand Dunes. It’s on the beach, has multiple pools (indoor and out) and is very nice. 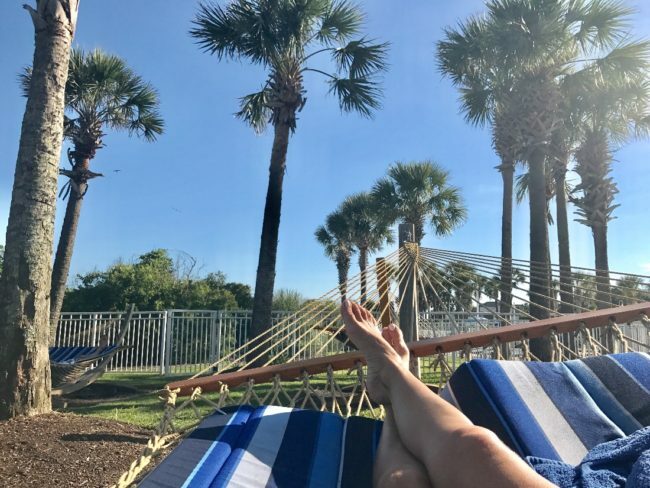 There’s no real bell service, turn down service or other super luxe amenities but the rooms are very comfortable, the pool area is clean and the staff is incredibly friendly. AND it’s extremely affordable, we had rooms with balconies for just a little over $200 per night. 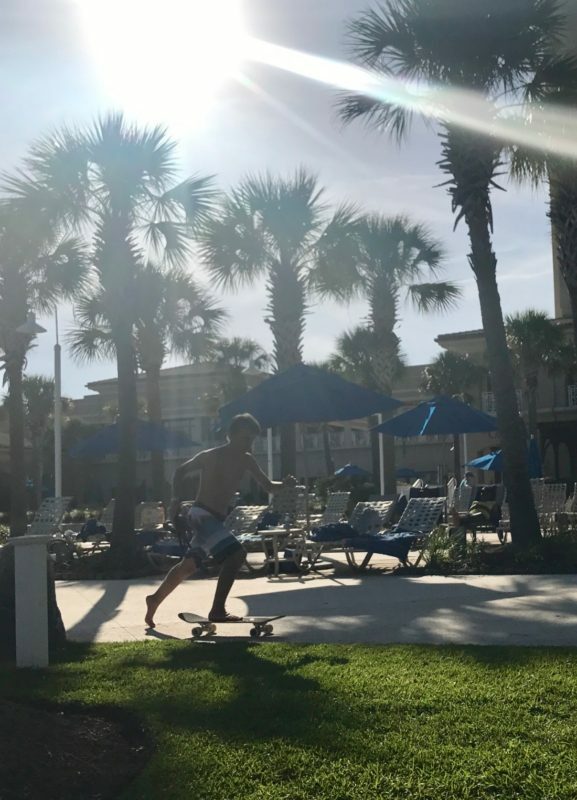 The boys rode their new skateboards all over the hotel and pool area, no one bothered them. There is a game room on the lower level full of wild kids playing video games and a bar just outside the door – happiness for everyone. But most importantly – there were hammocks. 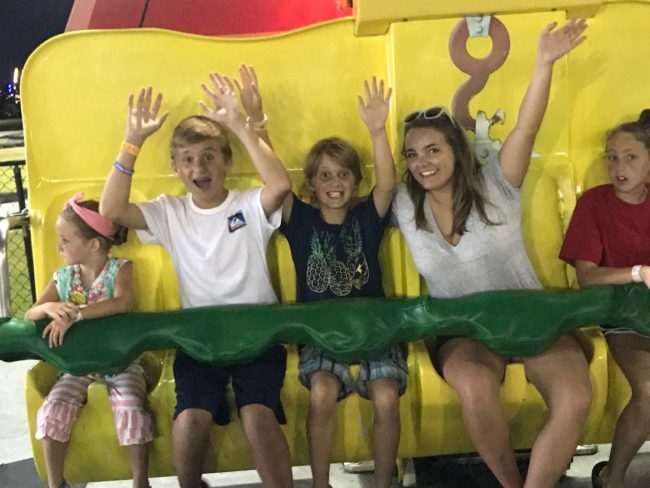 If you are in the South Carolina area and looking for some cheap and cheesy fun, I highly recommend a quick trip to Myrtle Beach. If you are looking for a more relaxed beach vacation, head elsewhere. 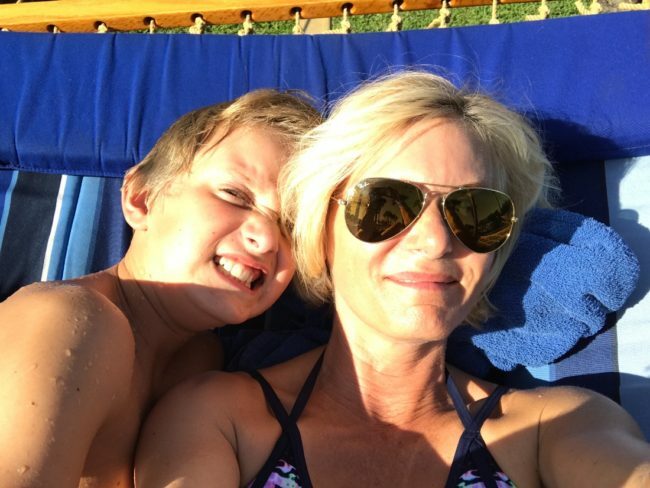 We had so much fun we have decided that it’s going to be a summer tradition – plus – we never got to eat at Medieval Times or lay on the bed of nails. This was not a press trip but I thought my readers would want to hear what’s fun in Myrtle Beach. The photos aren’t great, we barely pulled out our phones, we just wanted to enjoy our time together and be in the moment.